For Easter this year James and I went down to Utah to visit our families and have a small party with my family! (It's tradition..) So we decided to celebrate a week early and do our own thing. 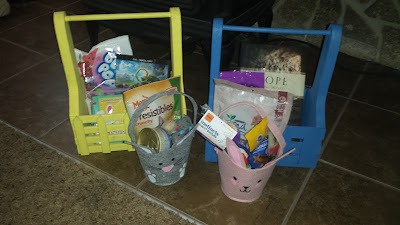 Our baskets have been made by my dad.. mine is super old and when I got married I wanted one to match mine so me and dad built it up and then I painted it and put on a cute little wooden turtle. I love my Easter baskets! I got my animals at Target in the dollar section! I thought they were adorable. And of course.. my animals need their own baskets ha ha. Needless to say they were content with their new toys and delicious treats! Aren't my nieces and nephew the cutest?! This is them getting ready to do the egg hunt! Which their grandma spoiled them rotten!! But hey they are worth it ha ha. 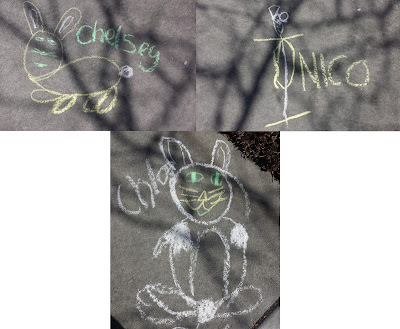 Before the hunt us girls decided to have a bunny drawing contest. And of course.. I way lost!! Chloe and Nico were the winners. Aren't the bunnies super cute? Easter was so much fun and I am grateful we were able to go down and spend time with our families. I love my family so much and I love spending time with them!! 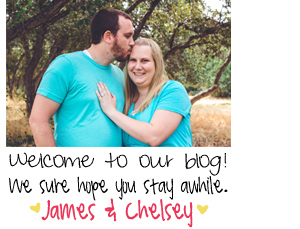 April Freebies & A Giveaway?!? !